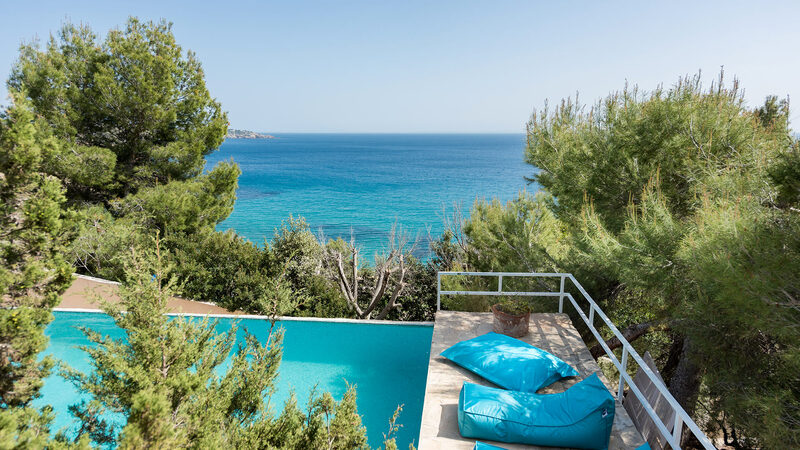 Villa of 260m2 located first sea line in the south-west coast of Ibiza with spectacular views towards the Mediterranean Sea and Formentera island. 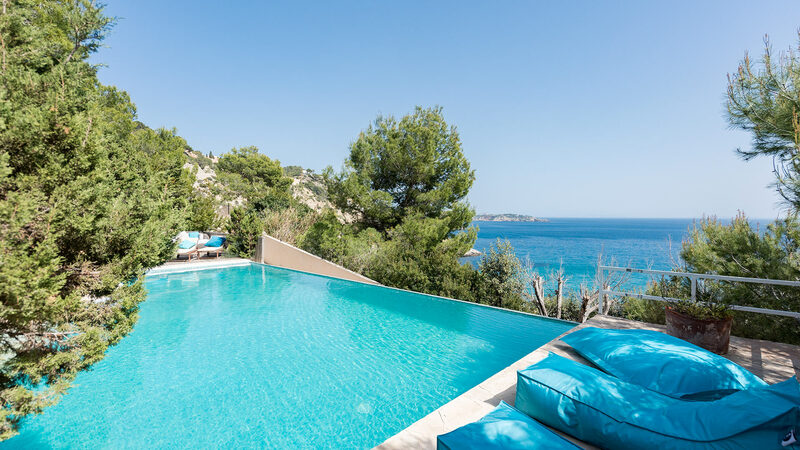 The 2-level villa has a 560m2 plot. 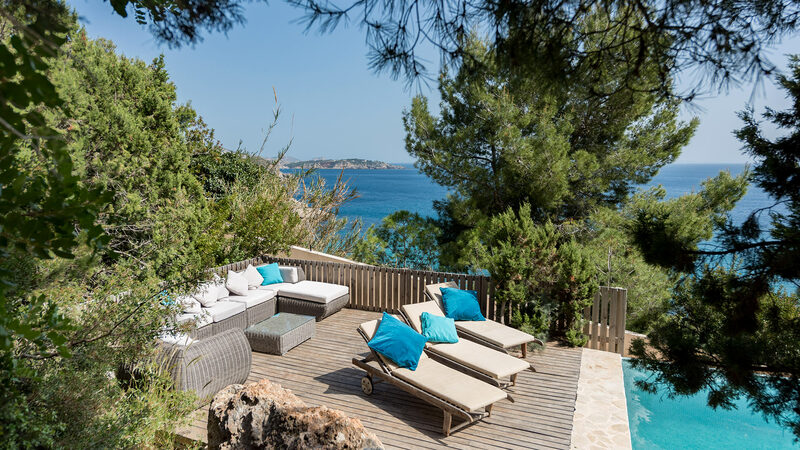 The exteriors of the villa are well kept and there are several places for the clients to relax around the terraces. 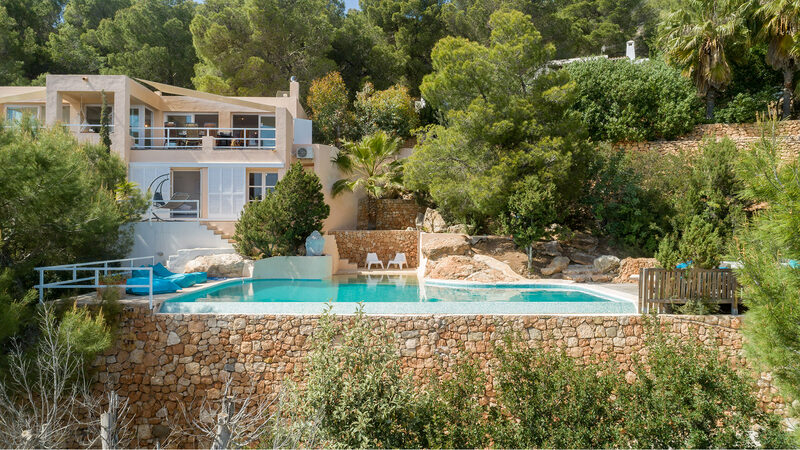 This villa is ideal for families or groups of friends that are looking for their perfect holidays in Ibiza. Room, Ground level. This bedroom has 1 double bed. Bathroom ensuite, With bathtub. WC in the bathroom. This bedroom includes also air conditioning. Room, Ground level. This bedroom has 1 double bed. Bathroom ensuite. WC in the bathroom. This bedroom includes also air conditioning. Room, 1st floor. This bedroom has 1 double bed. Bathroom ensuite, With shower. WC in the bathroom. This bedroom includes also air conditioning. Room, 1st floor. This bedroom has 1 double bed. Bathroom ensuite, With bathtub. WC in the bathroom. This bedroom includes also air conditioning. Living room with spectacular views towards the sea with sofas and Smart TV. Direct access to the main terrace with table and chairs for 8 guests. Two hanging swings to enjoy the moment watching the sea. Fireplace. Next to the terrace, there is a staircase that has access to the swimming pool deck. Fully equipped kitchen with: vitro hobs, smoke extractor, electric oven, fridge + freezer (combo), juice maker, Nespresso coffee machine, shaker, toaster, kettle, laundry machine. Private rectangular shaped swimming pool (12m x 6m). 6 sunbeds and 1 lounge sofa. Sea view terrace with chairs and table for 8 guests. Backside terrace with table and chairs for 8 guests. Uncovered parking for 2 cars. It is possible to walk to a close by restaurant which is 5-10min away or even walk to the village of Es Cubells only about 10-15min walk. Es Cubells: 3min by car. San José: 10min by car. Ibiza city: 20min by car. San Antonio: 20min by car. Ibiza Airport: 18min by car.